Basic Electricity is the presence of motion of electric charges. Electricity is all around us powering houses, offices and technologies like our cell phones, computers, lights, soldering irons, and air conditioners. We can’t imagine this world without electricity. It gives light to us, gives comfort, keeps us connected and provides almost all entertainment devices. For thousands of years, people were fascinated by lightning and people tried to put this power to practical use. We never knew lightning was electrical until the famous kite experiment by Sir Benjamin Franklin. Franklin in 1752 performed the experiment in which he flew a kite with a metal key in the string. As lightning struck, he received an electrical shock as the string was wet and he was lucky he survived. Then he proved that lightning was electrical. After that for many years, scientists were trying to find a way to use the electrical power to light up their homes. In 1879 American inventor Thomas Edison was finally able to produce a light bulb. To understand electricity, we need to first understand what electric charges are; from where they come and how do they move. Now let’s define electricity. It is the flow of electric charges. But in order to move electric charges, we need electric charge carriers. They are electrons and protons. 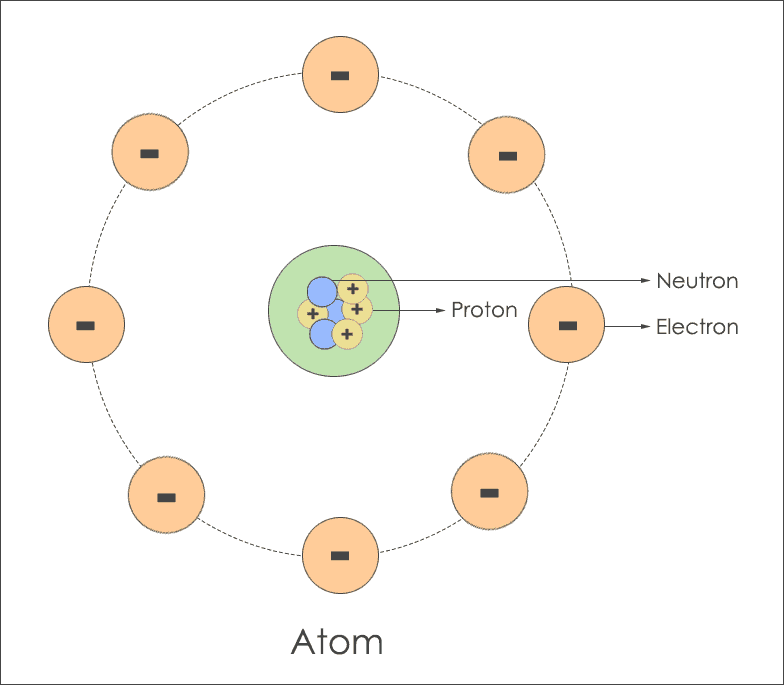 An atom mainly consists of three particles namely electron, proton, and neutron. Electron carries negative charge while proton carries positive energy. Neutron is neutral and has no charge. Both electron and proton carries the same amount of charge but the type of charge varies. But to make these charge carriers flow, there works a force between them called electrostatic force. Electrostatic force is the force that acts between the electrons and protons. It states that charges of the same type repel each other, while charges of opposite types are attracted together. Opposites attract, and likes repel. Some substances have atoms that release an electron and they are used as a conductor. A substance that allows electricity to pass through it is called conductor. This type of elements aids the electron flow. These types of elements are used to prepare wires. Examples of the conductor are copper, silver, gold, etc. While insulators are elements which do not aid electron flow and thus not let the electricity flow. They are used to make an outer covering of wire and other many safety materials. Examples of insulators are plastic, glass, wood etc. An electric field is a force that fills the space around every electric charge or group of charges. Electric fields are caused by electrical forces. Electrical forces are similar to gravitational forces in that they act between things that are not in contact with each other. Mathematically, the magnitude (or the strength) of an electric field at any point is defined by the force experienced by the charge at that point divided by the charge. This concept is written mathematically as E = F / q. Electric field strength is measured in units of Newton/coulomb. Electric fields are either static or dynamic. There are various methods of generating electricity. They are generated from different sources like heat, wind, sun, nuclear elements and many others. Thermal plants: A thermal power station is a power station in which heat energy is converted to electric power. In most of the places in the world, the turbine is steam-driven. Water is heated, turns into steam and spins a steam turbine which drives an electrical generator. Nuclear plants: Nuclear plants are one kind of thermal power plants but in them heating source is the nuclear reactor. Other renewable sources: Electricity is also generated by natural elements like sun, wind, water, etc. Some examples are solar panels, windmills, etc. When electricity is passed through the bulb, the element called tungsten inside the bulb is heated to 2000K to 3000K, which is less than the melting point of tungsten. Then, the energy is emitted in the form of visible light in a continuous spectrum which we see, and the most important part is most of the energy is given up as a heating effect which falls in the infrared region. Also, the filament is placed under a low-pressure inert gas which slows down the oxidation of the filament tungsten, hence increasing its lifeline. What makes your hair standing while you bring a plastic comb near them? This is not because of friction; this is because of static electricity. Static force is created when electric charges which are positive and negative are separated by an insulator and there is an imbalance in them. Means no. of positive charge carriers are not equal to negative charge carriers. Thus to create a balance between them, they can even flow through best conductors like wood, plastic, glass, etc. and so we experience static electricity. Lightning is the best visible example of static electricity. The ground consists of electrical charges and clouds also have some electrical charges. They try to create a balance and the insulator here is between the charges is air. And thus, static electricity is created and we see the visible lightning bolt. Electric energy is applied throughout the globe to provide power to home appliances, industrial devices, and consumer electronics. Here are some of the applications of electricity. In residential applications to power up the devices and equipment. In transportation as Electric vehicles, cars, and locomotive trains. Utility systems like boilers, High voltage transmission lines, and smart grid systems. Industrial purpose for compressors, blowers, cement and textile mills. That’s all about basics of electricity and it is the natural phenomena from which we can’t escape. Today we can’t imagine this world without electricity; we are all dependent on our mobile phones, computers, internet connection and many other things that work on electricity. Even if we escape from this gadgets and lightings, it will still remain in nature from the lightning strike and also the electrical signals in our brain.